Rob Guillory and John Layman have a wonderful relationship and their comic has a brilliant balance of plot deliverance and comic humour. Guillory has great comic timing and a level of exaggeration that is not overindulgent or grotesque. This cover is a lovely example of that as Tony Chu is on a new mission in the West Pacific to investigate the murder of a seal. That is an apt description of the absurdity of this comic, but it is so incredible funny and well drawn, that you fall for all of the characters. This cover is bright and euphoric with our central character seemingly singing from the rooftops with joy. It always amuses me how Rob draws gaping mouths and flapping uvulae to emphasis the more extreme emotions. 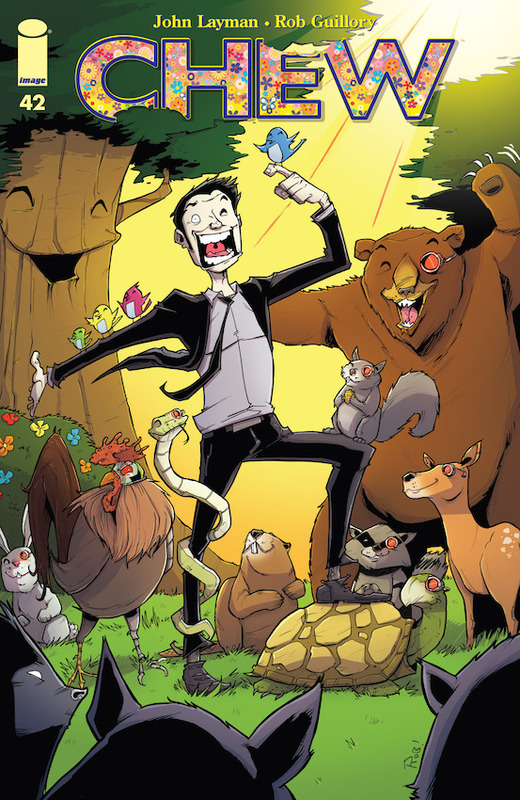 The other characters featured are drawn in typical style with caricatural animals grinning and beaming with joy. It is a quirky and amusing mid summer scene with a man at one with nature. I particularly like the multi-coloured birds on his shoulder, the bright sun from the corner and how he steps on a tortoise! The colours are bright and varied emphasising the effervescent environment and the happiness at hand. Of course there is one animal who is not to be duped by the over the top happiness: Poyo. The killer robot chicken is a seminal character of the comic and it is good to see him on the cover looking quite fierce and skeptical. I have no idea how this cover relates to the book but the luminous and happy vibe is well conveyed and beautifully aesthetic. Tony Chu’s joy is not allowed to last for long, so I look forward to his discovery of the underhanded shenanigans.